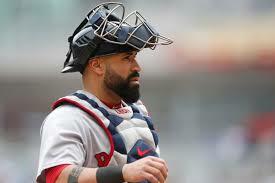 The odd man out is Sandy Leon in the Red Sox catchers story as Spring Training winds down as reported by Michael Silverman at the Boston Globe. This comes as the Red Sox placed Leon on waivers and look to start the 2019 season with Christian Vazquez, and Blake Swihart on its Opening Day roster. “We’re taking two (catchers),” manager Alex Cora said before Monday night’s game against the Cubs. While pitchers and coaches have raved about Leon's ability to manage pitchers and game calling, he's been weak on offense, slashing .201/.262/.317 over 589 plate appearances. Will teams be willing to pay the salary for a defense-only catcher or should Leon head to the minors to improve his hitting? Vazquez was recently extended so they won't give up on him and Cora liked what he saw in the postseason. Swihart is still looking for a defined roll with the Red Sox, having played around the diamond and catching, but the Red Sox like the potential for him to continue to develop. Should anything happen down the road, Boston might possibly be looking midseason to acquire a catcher at the trade deadline. Their only minor league depth at catcher is Juan Centeno. As Cora said, “You guys know how I feel about all of them. It’s just a matter that this season it would be hard to carry three of them. We’ll make a decision, and everybody will respect it, and we’ve got to go to Seattle."